The strategic need for speed and lower cost is driving clients to examine new, more efficient possibilities of how their projects are conceived, designed and delivered. 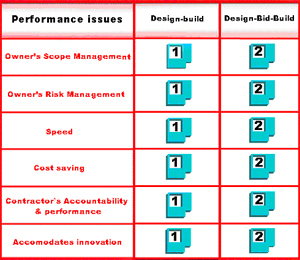 Design-Build is a procurement method and delivery mechanism in which one entity is contractually responsible for both design and construction of a project. It has been use for over 50 years as EPC (Engineer-Procure-Construct) in the industrial sector and its application to building design and interiors has grown exponentially in the past two decades in U.S, Europe, Japan and now, India. As per industry statistics, Design-Build has become the project delivery system of choice for more than 50% of non-residential construction projects in European Community and in more than 70% of non-residential projects in Japan. 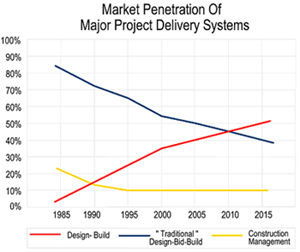 A market penetration survey of major delivery systems in U.S reveals that 40% of building and interior projects at the moment are serviced by Design-Build. It is expected that by year 2010, Design-Build will become the dominant delivery mechanism. Utilizing Design-Build is a new way of doing business, a major cultural shift. It manages to align the interests of clients, designers, constructors and suppliers through a transparent process of constructibility assessment, design development, cost analysis and realistic scheduling. It is an integrated process that enables formation of a cohesive team of players who benefit from positive partnering and open communication. It nurtures far more innovation, creativity and project control than any other modes of delivery. In India, our inheritance of statutory and case laws from Britain determined legal rather than functional separation between design and construction. Liability differences encourage an artificial separation between design and construction agencies, creating adversarial relationships and interests that work at cross-purposes. 'Traditional' Design-Bid-Build in India has ossified into an inefficient mechanism incapable of delivering fast track, value engineered solutions that address the need of clients competing in a global economy for 'just in time capacity additions' and 'first to market new products' into a competitive advantage. Peculiar to India is the issue of limited designer liability coupled with low contractor efficiency and credibility. Only rarely do clients get comprehensive performance guarantees and post-completion warranties without exceptions. Clients are now demanding total facility delivery systems with both design and construction in the hands of a single entity, with a single point of responsibility for quality, cost and schedule adherence. With Design-Build clients are able to focus on scope / needs definition and timely decision making, rather than coordinating between designers, associated consultants and numerous contractors. Regrettably, a perception remains in India that Design-Build applies only to the simplest of projects, mostly interiors. The true potential of this delivery mechanism to revolutionize the Indian construction industry is yet, un-fulfilled. Planet 3 Studios Architecture Pvt. Ltd. has pioneered the use of architect-led Design-Build for a variety of projects in India. The quantifiable success of these deliveries and an ever-growing list o Corporate and Institutional clients are proof enough of the efficacy of the system. Planet 3 Studios Architecture Pvt. Ltd. leads the initiative to employ globally accepted 'Best Practices' and to evangelize the benefits of Design-Build to the end users and the industry alike.